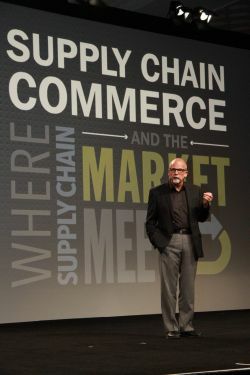 Manhattan's 2013 user conference showed that supply chain is as much about commerce as it is about operations. Eddie displayed a series of statistics about Manhattan: 1,200 global customers, nearly 100 of those customers in Manhattan’s Supply Chain Leaders program, 287 go lives in 2012, $45M R&D investment in 2012, $300M cumulative R&D since 2006, 2400 employees. He then showed SCOPE 2.0, not a new architecture, but a new perspective on their suite (see Figure 1). Next up, David Landau in his role now as VP of Product Management, made the point that the most valuable shoppers want same-day delivery and are willing to pay for it. And omni-channel is radically changing the mix. For example, Manhattan customer Rocky Brands went from 80% full case shipments down to only 16% and at the same time took order cycle times from 3 days down to 5 hours. Omni-channel thus requires operational agility—DCs that were originally purpose-built must now be multi-purpose and support multiple simultaneous workflows efficiently, maximizing capital assets and labor force productivity. The implication for the software is the need to continuously re-evaluate orders, promise dates, and capacities in near real-time. Manhattan is also developing a mobile supervisor capability on the iPad. David talked about how their yard management system ties together the warehouse and transportation management systems, enabling operation at the pace that only a platform can provide, reducing or eliminating waiting for dock door and empty trailers sitting idle. Brian Kinsella, VP Order Management, described Manhattan’s evolution from inventory visibility to their current availability and order promising capabilities. 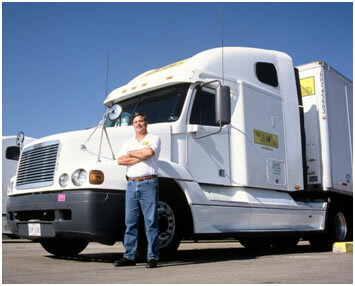 This requires a deep set of capabilities to do order promising across all inventory, such as aggregating inventory, adding in-transit inventory into the mix, considering purchase orders that are on order with reliable delivery dates, removing units as they are allocated, removing units damaged in the DC, virtually segmenting inventory, and making decisions about how many units should be available for each channel, and in-store fulfillment of orders. The move to omni-channel fulfillment and services is a huge change for store operations and their personnel, essentially turning stores into mini-DCs with service and fulfillment speed expectations as fast as a regular DC, while still serving in-store customers. This includes taking into account labor capacity planning and constraints. If a store does not have the labor capacity to get a unit out the door, then the system shouldn’t make it available. Manhattan’s system can smooth out the work flow to match the pick, pack, and ship capacities in the store. It also impacts merchants and planners. They put a lot of thought into allocation, plans, and replenishment. 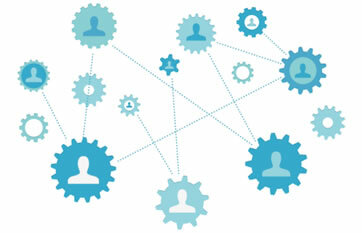 Omni-channel fulfillment goes in and changes what is getting fulfilled from where. Merchants and planners need tools for ‘inventory protection,’ the ability to say, “X units of this SKU can be used only for this purpose/channel/location,” to ensure the minimum required number of units in the store so that the assortment and presentation looks good. Inventory availability data can be served up at POS, in-store mobile device for associates, and directly to consumers via e-commerce and mobile-commerce. Brian said Manhattan makes Order Management the place for delivering great customer service, by enabling store associates or call center operators to see all the orders, transactions, and inventory and allowing them to change the order, payment method, and handle complex returns and exchanges. After Matthew we heard from Steve Wozniak, co-founder of Apple. As a former engineer and still a geek, I really enjoyed his talk, enthusiasm, and sense of ethics. Later on day one, I attended a session on the future of SCALE, which is Manhattan’s Microsoft-based platform. This platform addresses the small and mid-market segment that wants an affordable and quick-to-implement system. It also represents a relatively small portion of Manhattan’s revenue. But Manhattan had their top brass presenting at this breakout session. There was CEO Eddie Capel, VP of Product Mgmt. David Landau, Darryl Barr, Manhattan’s Director of Product Management in charge of SCALE, along with customer Jim Casselman. This was a show of commitment to the future of the platform. And it was welcomed. The room was packed with about 90 to 100 people, literally standing room only. The users of this platform really cared about Manhattan’s ongoing support and investment. David Landau talked about the next few releases which will focus on personalization—desktop gadgets, creating your own personal experience; extensibility—methods to incorporate custom code with little to no upgrade impact; embedded analytics—operational reporting via embedded Cognos which can manipulate SCALE data, with drill through functionality; Mobility and BYOD—device independence; and deployment cloud hosting TCO strategies—doing some things around disaster recovery leveraging Microsoft cloud. Jim Casselman, CIO of Buffalo Hospital, said they became a SCALE customer in 2003. They were doubling sales, and Jim was tasked with finding a solution and getting it up and running in six months. They decided SCALE was the right platform. Within a few months after go live, they were able to reduce 27 FTEs because of the efficiencies. In 2009, they implemented voice picking technology, and have continued to find valuable functional changes in each and every upgrade so far. They have the same sized three-person IT group as in 2003, while growing the business 30%. Interestingly, Darryl Barr spent much of his time talking about Yammer (enterprise social networking) adoption, in response to requests for a more efficient way for the customer product councils to voice opinions. This is especially important to give a voice to SCALE’s international customer base across time zones. They started internally with what was supposed to be a three-month proof of concept study. 80% of Manhattan’s workforce was using it within 17 days, and over 90% within 30 days. Darryl said now there is no turning back. So they decided to extend it to the product councils, not just for dialog between Manhattan and the councils, but for dialog between customers. They rolled it out first to two councils as early adopters—SCALE was one of them. They have gotten good feedback and they are now rolling it out in full force for all product councils. With these requests and conversations housed in Yammer, Manhattan can see the reasons why the users chose a particular path. Voting on priorities can be done as well. Another standing room only session was given by Fortna’s Jason Denmon and Adam Mullen. They talked about how Omni-channel (order from anywhere, fulfill from anywhere) impacts transportation, inventory management, planning, distribution systems, purchasing, merchandise and allocation, DC design, and network strategy. The implications are profound. By definition DCs will now have a mix of fast and slow movers, requiring a different design. Network strategy teams, operational design teams and merchandise and allocation teams need to go through what scenarios are possible. I attended this session given by Orin Wilcox, Director, Carrier Support and R&D for Manhattan. This was an update on tools Manhattan provides for transportation carriers. These tools, while not having the most modern look and feel, are deep in functionality. Orin showed commitment management tools, with the ability to see how many commitments were left to book, the ability to release commitments when the customer has not called by a certain time, automatic redistribution or clearing of remaining commitments, the ability to add comments to a commitment, and the ability to set policy for remaining commitments. Much of the time was dedicated to talking about 2013 hours-of-service regulation (compliance date July 1, 2013) and how Manhattan’s execution suite will help carriers deal with those changes. This is a painful issue for trucking companies to deal with. Any help in optimizing and reducing the impact is sorely needed. Orin described new support in the Driver&Load and Drop&Swap functionality. He showed screens with updated inputs, fields, and calculations for hours of service. Companies may consider throwing hours away to improve performance, reduce deadhead miles, etc. The platform lets them optimize against early/late, hours of service, and other parameters, to come up with the best driving and resting pattern. After a year of use, Manhattan realized that “all possible combinations” optimization can be very CPU-intensive. So this year, they have an option to examine just the dispatch point and first pickup, with all other stops handled as before, resulting in most of the optimization benefits, with much faster processing. He also showed driver repositioning tools that help in shifting trucks between markets, giving recommendations on which trucks to shift while honoring constraints or rules. Proactive Swapping is where Drop&Swap takes the entire fleet and ranks them from the driver that is the biggest problem on down, provides recommendations without anyone having to ask, and ideally finds swaps that are great for both trucks. Orin showed product council requests for MPH rating tokens, Fuel&Route enhancements, route-line restriction options, and more. We began day two of Momentum with a press conference with Manhattan’s leadership team: Eddie Capel, Jonathan Colehower, and David Landau. Eddie said their strategy in a nutshell is to 1) capitalize on omni-channel commerce, 2) expand into under-penetrated markets, both geographically (EU and Asia) and deeper into the store, and 3) “Execute to perfection.” They have 1,500 stores up and live with Store Inventory & Fulfillment with 2,700 more in process. The major initiatives in Manhattans 2013 Releases are 1) Omni-channel, 2) Manufacturing, 3) User Experience, and 4) Science and Optimization. Omni-Channel—This is about Store Inventory and Fulfillment and Distributed Order Management integration with PayPal and DemandWare, distributed selling, and out-of-the-box integration with leading storefronts. It includes more advanced ways of doing flow-through distribution, making real-time dynamic allocation decisions when the trailer hits the door, to postpone those decisions as late as possible. Manufacturing—In transportation, Manhattan is improving primary network planning, benchmark rate integration, and the ability to share internal data such as a forecast of transportation with carriers. YMS (Yard Management System) integration for carrier selection and drop shipment programs; trailers are dropped off in the yard, to be loaded when ready. Without YMS integration, the TMS has no idea what is in the yard, so they may pick the cheapest carrier without knowing that another carrier already has the right equipment right there in the yard. For WMS, standardized dock appointment scheduling allows carriers to log in and do self-service scheduling. For TMS, vendor and carrier portals let them log in and tender loads. For YMS, there is an ‘Express service pass’ capability. Yards are getting more crowded and busy, check in time takes too long, and often the check in guy doesn’t have enough info. With express service pass, the driver gets a bar coded pass that tells them exactly where to go in the yard. User Experience—Referred to as a “WebTop,” where you can pin any specific function to the desktop and add filters, such as show me ‘late shipments due today.’ Each chart is a portlet that can be moved where you want. Global search capabilities, for example you want to find a shipment, but don’t have the order number or vendor name. You can put in the data on the store and time frame and it will search not just WMS or TMS, but all of SCOPE and show all the data matching that string of text or attributes, including POS data, ASNs, distribution orders, etc. Then you can add criteria to narrow the results–like status, contains item, origin type, pickup facility, etc. They are also rolling out the Mobile Supervisor, a set of portlets in a dashboard, that can come from any part of the platform, and you then can drill down. New Science and Optimization—Transportation Modeling Services, Manhattan has a team that can model things for its customers, like how big your fleet should be, which days of the week should they be shipping, performance optimization, analysis and simulation. This includes labor simulation, to look at how effective your workforce currently is, and play what if, such as change a process, move a printer station, or change labor standards. In demand forecasting they have new SKU modeling capabilities, for new items that have never been sold, the system helps find ‘similar SKUs,’ and then models ramp up and ramp down of demand. They are introducing travel-time-aware case and pallet allocation logic, for inventory that is coming from as many as five different zones. Besides attending sessions, I was able to walk the exhibit floor and talk to some of the Manhattan product managers about key modules. 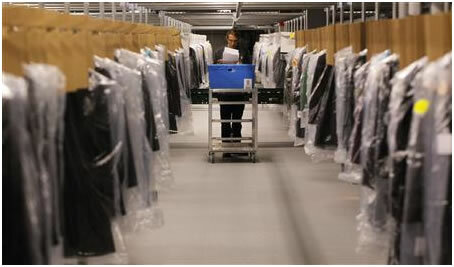 Store Inventory and Fulfillment are the tools that allow store associates to do cycle counting and fulfill orders from the store (pick, pack, ship). It is sort of like mini-WMS designed for the store. Orders get queued up in the store to be filled, the store acknowledges receipt of the order, and then acknowledges that they have the inventory and will fill it. The system monitors whether SLAs (Service Level Agreements) are being met (like commitment to a customer that an order will be ready to pick up at a specific time). When SLAs are not being met, there is escalation logic. 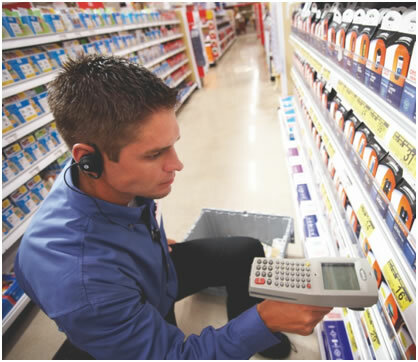 For higher-volume stores, SIF can do picking waves and optimize picking paths, which is especially useful for large-footprint stores. The system or the store manager can also adjust the store’s capacity in real time, based on customer traffic in the store that is consuming associates’ time, or other factors like remodeling is being done in a department. SIF works hand-in-hand with DOM, which takes feeds from all the different ordering systems and then looks at inventory across locations and decides where to fulfill it from, based on rules and optimization algorithms. These can get complex–do you allow orders to be spilt or not, will you allow a merge bringing items from different locations, etc. As new channel systems are plugged in, it is about getting orders into DOM from them and doing order promising. This was an interesting session with Kevin Bube, product manager from Manhattan, and Tedd Winneberger, Trading Partner Analyst at Under Armour. The idea is to get end-to-end visibility all the way from sourcing to your outsourced manufacturers to delivery to your customers. This is typically implemented in phases. You may have an operational need in WMS or Order Management that needs visibility, or start with a visibility project, like, “Where’s my stuff?” With Manhattan, you can track orders and ASNs on a map–and then click and drill down. The system tracks milestones against an order, like PO created, accepted, ready to ship, shipped to port, received at port, container loaded, cleared customs, and carrier pickup. If any are past due, you can set up alerts for the user to take action, like re-forecasting the schedule based on those delays. Some of this can be automated via ‘process orchestration.’ For example, if a supplier ships late, it could trigger a web service call that automatically issues a chargeback to the supplier, and perhaps a workflow to redirect or expedite the shipment. Under Armour has milestones associated with each PO including cut, sew, book, ship, vessel loaded, arrived, unloaded, and cleared customs. They work with about 75 factories. Events are brought in by EDI automatically from their factory’s production system or manually entered in the portal. Visibility is by exception. They don’t want to know about all the orders that are on time, only those where there is a problem needing attention. They don’t currently go all the way back to the raw materials. They nominate the mill, but the factory is responsible for the raw materials status. They do see that possibility in the future, but the first need is to get this current piece done and working well. Jeff Cashman, SVP Business Development, led an engaging customer panel on the afternoon of day two, with United Stationers, Cardinal Health, and PetSmart. Much of the discussion was around omni-channel. McKesson talked about the impact of healthcare reform and uniqueness of the healthcare supply chain. 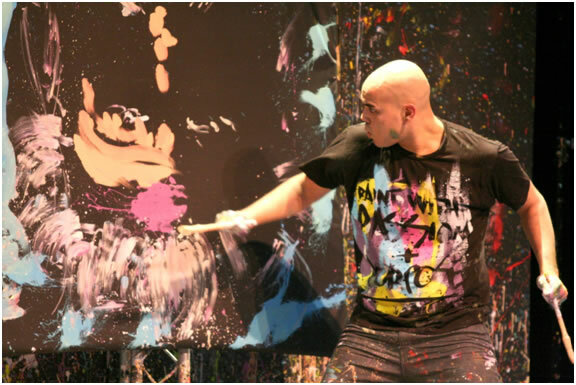 The afternoon was capped off with a performance by dancer-painter David Garibaldi. He did portraits of Frank Sinatra, Elvis Presley, and Albert Einstein all while dancing to music. 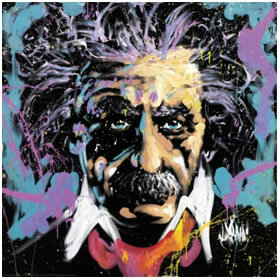 He painted the Einstein portrait upside down, so it took a while to see the image appear, but was a delightful surprise. These were raffled off to Manhattan customers in the audience. A lot of fun and very entertaining. Manhattan has been able to leverage their dominant position in the warehouse and take advantage of the huge driving force of omni-channel commerce with products like Store Inventory and Fulfillment and Distributed Order Management. Each software company’s culture seems to be reflected in their annual user conferences and I think Manhattan’s customers really appreciate the integrity, reliability, and commitment demonstrated over the years by Manhattan.